Niacin, also known as vitamin B3 and nicotinic acid, is an organic compound with the formula C6H5NO2 and, depending on the definition used, one of the 20 to 80 essential human nutrients. Pharmaceutical and supplemental niacin are primarily used to treat hypercholesterolemia (high cholesterol) and pellagra (niacin deficiency). Insufficient niacin in the diet can cause nausea, skin and mouth lesions, anemia, headaches, and tiredness. The lack of niacin may also be observed in pandemic deficiency disease, which is caused by a lack of five crucial vitamins (niacin, vitamin C, thiamin, vitamin D, and vitamin A) and is usually found in areas of widespread poverty and malnutrition. Niacin is provided in the diet from a variety of whole and processed foods, with highest contents in fortified packaged foods and meat from various animal sources. 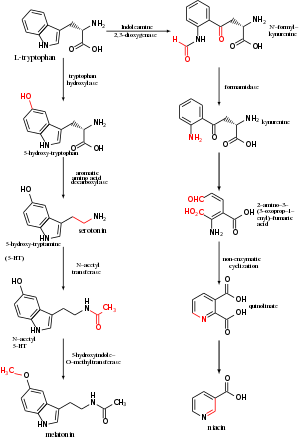 2), as well as more complex amides and a variety of esters. Nicotinic acid and niacinamide are convertible to each other with steady world demand rising from 8,500 tonnes per year in the 1980s to 40,000 in recent years. Niacin cannot be directly converted to nicotinamide, but both compounds are precursors of the coenzymes nicotinamide adenine dinucleotide (NAD) and nicotinamide adenine dinucleotide phosphate (NADP) in vivo. NAD converts to NADP by phosphorylation in the presence of the enzyme NAD+ kinase. NADP and NAD are coenzymes for many dehydrogenases, participating in many hydrogen transfer processes. NAD is important in catabolism of fat, carbohydrate, protein, and alcohol, as well as cell signaling and DNA repair, and NADP mostly in anabolism reactions such as fatty acid and cholesterol synthesis. High energy requirements (brain) or high turnover rate (gut, skin) organs are usually the most susceptible to their deficiency. Niacin supplementation has not been found useful for decreasing the risk of cardiovascular disease in those already on a statin, but appears to be effective in those not taking a statin. Although niacin and nicotinamide are identical in their vitamin activity, nicotinamide does not have the same pharmacological effects (lipid modifying effects) as niacin. Nicotinamide does not reduce cholesterol or cause flushing. As the precursor for NAD and NADP, niacin is also involved in DNA repair. The Food and Nutrition Board of the U.S. Institute of Medicine updated Estimated Average Requirements (EARs) and Recommended Dietary Allowances (RDAs) for niacin in 1998. The current EARs for niacin for women and men ages 14 and up are 11 mg/day and 12 mg/day, respectively; the RDAs are 14 and 16 mg/day, respectively. RDAs are higher than EARs so as to identify amounts that will cover people with higher than average requirements. RDA for pregnancy equals 18 mg/day. RDA for lactation equals 17 mg/day. For infants up to 12 months the Adequate Intake (AI) is 2–4 mg/day. and for children ages 1–13 years the RDA increases with age from 6 to 12 mg/day. As for safety, the Food and Nutrition Board also sets Tolerable Upper Intake Levels (known as ULs) for vitamins and minerals when evidence is sufficient. In the case of niacin the UL is set at 35 mg/day. The European Food Safety Authority reviewed the same safety question and set its UL at 10 mg/day. Safety issues are presented at length in the Side Effects section. Collectively the EARs, RDAs, AIs and ULs are referred to as Dietary Reference Intakes. For U.S. food and dietary supplement labeling purposes, the amount in a serving is expressed as a percent of Daily Value (%DV). For niacin labeling purposes, 100% of the Daily Value was 20 mg, but as of May 2016 it has been revised to 16 mg. A table of the pre-change adult Daily Values is provided at Reference Daily Intake. Food and supplement companies have until July 28, 2018, to comply with the change. Niacin is found in a variety of whole and processed foods, including fortified packaged foods, meat from various animal sources, seafoods, and spices. Fortified breakfast cereals have among the highest niacin contents (more than 20 mg per 100 grams). Whole grain flours, such as from wheat, rice, barley or corn, and pasta have niacin contents in a range of 3–10 mg per 100 grams. 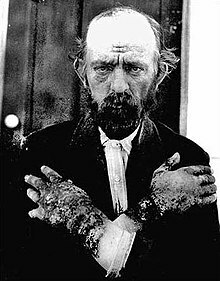 Between 1906 and 1940 more than 3 million Americans were affected by pellagra with more than 100,000 deaths. Dr. Joseph Goldberger was assigned to study pellagra by the Surgeon General of the United States and produced good results. In the late 1930s, studies by Dr. Tom Spies, Marion Blankenhorn, and Clark Cooper established that niacin cured pellagra in humans. The disease was greatly reduced as a result. At present, niacin deficiency is sometimes seen in developed countries, and it is usually apparent in conditions of poverty, malnutrition, and chronic alcoholism. It also tends to occur in areas where people eat maize (corn) as a staple food, since it is the only grain low in digestible niacin. A cooking technique called nixtamalization increases the bioavailability of niacin during maize meal/flour production. Mild niacin deficiency has been shown to slow metabolism, causing decreased tolerance to cold. Severe deficiency of niacin in the diet causes the disease pellagra, which is characterized by diarrhea, dermatitis, and dementia, as well as Casal's necklace lesions on the lower neck, hyperpigmentation, thickening of the skin, inflammation of the mouth and tongue, digestive disturbances, amnesia, delirium, and eventually death, if left untreated. Common psychiatric symptoms of niacin deficiency include irritability, poor concentration, anxiety, fatigue, restlessness, apathy, and depression. Studies have indicated that, in patients with alcoholic pellagra, niacin deficiency may be an important factor influencing both the onset and severity of this condition. Patients with alcoholism typically experience increased intestinal permeability, leading to negative health outcomes. Hartnup disease is a hereditary nutritional disorder resulting in niacin deficiency. This condition was first identified in the 1950s by the Hartnup family in London. It is due to a deficit in the intestines and kidneys, making it difficult for the body to break down and absorb dietary tryptophan. The resulting condition is similar to pellagra, including symptoms of red, scaly rash, and sensitivity to sunlight. Oral niacin is given as a treatment for this condition in doses ranging from 40–200 mg, with a good prognosis if identified and treated early. Niacin synthesis is also deficient in carcinoid syndrome, because of metabolic diversion of its precursor tryptophan to form serotonin. Niacin is sometimes used in addition to other lipid-lowering medication. Systematic reviews of studies did not find that taking niacin affected either cardiovascular disease or risk of death in those already taking a statin, in spite of raising HDL cholesterol. Niacin alone appears to reduce the rate of cardiovascular events, but not the rate of coronary or cardiovascular deaths. Niacin and niacinamide are used for prevention and treatment of pellagra. Niacin is contraindicated with active liver disease, persistent elevated serum transaminases, active peptic ulcer disease, or arterial bleeding. The most common adverse effects are flushing (e.g., warmth, redness, itching or tingling), headache, pain, abdominal pain, diarrhea, dyspepsia, nausea, vomiting, rhinitis, pruritus and rash. These can be minimized by initiating therapy at low dosages, increasing dosage gradually, and avoiding administration on an empty stomach. High doses of niacin often temporarily reduce blood pressure as a result of acute vasodilation. In the longer term, high-dose niacin use may persistently lower blood pressure in individuals with hypertension, but more research is needed to determine the extent of this effect. Flushing usually lasts for about 15 to 30 minutes, though it can sometimes last up to two hours. It is sometimes accompanied by a prickly or itching sensation, in particular, in areas covered by clothing. Flushing can be blocked by taking 300 mg of aspirin half an hour before taking niacin, by taking one tablet of ibuprofen per day or by co-administering the prostaglandin receptor antagonist laropiprant. Taking niacin with meals also helps reduce this side effect. Acquired tolerance will also help reduce flushing; after several weeks of a consistent dose, most patients no longer experience flushing.Reduction of flushing focuses on altering or blocking the prostaglandin mediated pathway. Slow- or "sustained"-release forms of niacin have been developed to lessen these side effects. One study showed the incidence of flushing was significantly lower with a sustained-release formulation, though doses above 2 g per day have been associated with liver damage, in particular, with slow-release formulations. Prostaglandin (PGD2) is the primary cause of the flushing reaction, with serotonin appearing to have a secondary role in this reaction. The effect is mediated by prostaglandin E2 and D2 due to GPR109A activation of epidermal Langerhans cells and keratinocytes. Langerhans cells use cyclooxygenase type 1 (COX-1) for PGE2 production and are more responsible for acute flushing, while keratinocytes are COX-2 dependent and are in active continued vasodilation. Flushing was often thought to involve histamine, but histamine has been shown not to be involved in the reaction. Gastrointestinal complaints, such as indigestion, nausea and liver failure, have also been reported. Hepatotoxicity is possibly related to metabolism via amidation resulting in NAD production. The time-release form has a lower therapeutic index for lowering serum lipids relative to this form of toxicity. Although high doses of niacin may elevate blood sugar, thereby worsening diabetes mellitus, recent studies show the actual effect on blood sugar to be only 5–10%. Patients with diabetes who continued to take anti-diabetes drugs containing niacin did not experience major blood glucose changes. Thus, overall, niacin continues to be recommended as a drug for preventing cardiovascular disease in patients with diabetes. Hyperuricemia is another side effect of taking high-dose niacin and may exacerbate gout. Side effects of heart arrhythmias have also been reported. [page needed] Increased prothrombin time and decreased platelet count have been reported; therefore, these should be monitored closely in patients who are also taking anticoagulants. Particularly the time-release variety, at extremely high doses, can cause acute toxic reactions. Extremely high doses of niacin can also cause niacin maculopathy, a thickening of the macula and retina, which leads to blurred vision and blindness. This maculopathy is reversible after niacin intake ceases. Niacin in doses used to lower cholesterol levels has been associated with birth defects in laboratory animals, with possible consequences for infant development in pregnant women. Niacin's therapeutic effects are partly mediated through the activation of G protein-coupled receptors, including niacin receptor 1 (NIACR1) and niacin receptor 2 (NIACR2) which are highly expressed in adipose tissue, spleen, immune cells and keratinocytes but not in other expected organs such as liver, kidney, heart or intestine. NIACR1 and NIACR2 inhibit cyclic adenosine monophosphate (cAMP) production and thus fat breakdown in adipose tissue and free fatty acids available for liver to produce triglycerides and very-low-density lipoproteins (VLDL) and consequently low-density lipoprotein (LDL) or "bad" cholesterol. Decrease in free fatty acids also suppress hepatic expression of apolipoprotein C3 (APOC3) and PPARg coactivator-1b (PGC-1b) thus increase VLDL turn over and reduce its production. It also inhibits diacylglycerol acyltransferase-2 (important hepatic TG synthesis). The mechanism behind increasing HDL is not totally understood but it seems to be done in various ways. Niacin increases apolipoprotein A1 levels due to anti catabolic effects resulting in higher reverse cholesterol transport. It also inhibits HDL hepatic uptake, down-regulating production of the cholesterol ester transfer protein (CETP) gene. Finally, it stimulates the ABCA1 transporter in monocytes and macrophages and up-regulates peroxisome proliferator-activated receptor γ results in reverse cholesterol transport. It reduces secondary outcomes associated with atherosclerosis, such as low density lipoprotein cholesterol (LDL), very low-density lipoprotein cholesterol (VLDL-C), and triglycerides (TG), but increases high density lipoprotein cholesterol (HDL). Despite the importance of other cardiovascular risk factors, high HDL was associated with fewer cardiovascular events independent of LDL reduction.Other effects include anti-thrombotic and vascular inflammation, improving endothelial function, and plaque stability. Adipokines are the adipocytes’ produced mediators. Some adipokines such as tumor necrosis factor (TNF)-a, interleukins and chemokines, have pro-inflammatory effect and some others such as adiponectin have anti-inflammatory effect that regulates inflammatory process, decrease vascular progression and atherosclerosis. Niacin also appears to upregulate brain-derived neurotrophic factor (BDNF) and tropomyosin receptor kinase B (TrkB) expression. Research has been able to show the function of niacin in the pathway lipid metabolism. It is seen that this vitamin can decrease the synthesis of apoB-containing lipoproteins such as VLDL, LDL, IDL and Lipoprotein (a) via several mechanisms: (1) Directly inhibiting the action of DGAT2, a key enzyme for triglyceride synthesis; (2) It has the ability to bind to the receptor HCAR2 thereby decreasing lipolysis and FFA flux to the liver for triglyceride synthesis; and (3) increased apoB catabolism. On the other hand, HDL cholesterol levels are increased by niacin through direct and indirect pathways. (4) Niacin decreases CETP mass and activity, and this synergistic effect with the decrease in triglyceride levels, can indirectly raise HDL cholesterol levels. The study has also been able to show direct effects on the beta chain of ATP synthase (5) and on production (6) and hepatic uptake (7) of apoA-I also increase HDL cholesterol levels. Thus by affecting the pathway reducing lipid levels help in reducing CVD. The liver can synthesize niacin from the essential amino acid tryptophan, requiring 60 mg of tryptophan to make one mg of niacin. Riboflavin, vitamin B6 and iron are required in some of the reactions involved in the conversion of tryptophan to NAD. Several thousand tons of niacin are manufactured each year, starting from 3-methylpyridine. Many preparations of niacin are available over-the-counter as dietary supplements. Non-prescription extended release niacin, such as Endur-acin, which uses a wax matrix to delay release is available as well. Over-the counter plain niacin has FDA regulatory approval. Some “no flush” types, such as inositol hexanicotinate contain convertible niacin compounds, but have little clinical efficacy in reducing cholesterol levels. “Slow release” varieties have higher hepatotoxic activity, hence some types of prescription niacin are not recommended due to potential harm. A prescription extended release niacin, Niaspan, has a film coating that delays release of the niacin, resulting in an absorption over a period of 8–12 hours. The extended release formulations generally reduce vasodilation and flushing side effects, but increase the risk of hepatotoxicity compared to the immediate release forms. A formulation of laropiprant (Merck & Co., Inc.) and niacin had previously been approved for use in Europe and marketed as Tredaptive. Laropiprant is a prostaglandin D2 binding drug shown to reduce vasodilatation and flushing up to 73%. The HPS2-THRIVE study, a study sponsored by Merck, showed no additional efficacy of Tredaptive in lowering cholesterol when used together with other statin drugs, but did show an increase in other side effects. The study resulted in the complete withdrawal of Tredaptive from the international market. One form of dietary supplement is inositol hexanicotinate (IHN), which is inositol that has been esterified with niacin on all six of inositol's alcohol groups. IHN is usually sold as "flush-free" or "no-flush" niacin in units of 250, 500, or 1000 mg/tablets or capsules. It is sold as an over-the-counter formulation, and often is marketed and labeled as niacin, thus misleading consumers into thinking they are getting the active form of the medication. While this form of niacin does not cause the flushing associated with the immediate-release products, the evidence that it has lipid-modifying functions is disputed. As the clinical trials date from the early 1960s (Dorner, Welsh) or the late 1970s (Ziliotto, Kruse, Agusti), it is difficult to assess them by today's standards. One of the last of those studies affirmed the superiority of inositol and xantinol esters of nicotinic acid for reducing serum free fatty acid, but other studies conducted during the same period found no benefit. Studies explain that this is primarily because "flush-free" preparations do not contain any free nicotinic acid. A more recent placebo-controlled trial was small (n=11/group), but results after three months at 1500 mg/day showed no trend for improvements in total cholesterol, LDL-C, HDL-C or triglycerides. Thus, so far there is not enough evidence to recommend IHN to treat dyslipidemia. Nicotinamide may be obtained from the diet where it is present primarily as NAD+ and NADP+. These are hydrolysed in the intestine and the resulting nicotinamide is absorbed either as such, or following its hydrolysis to nicotinic acid. Nicotinamide is present in nature in only small amounts. In unprepared foods, niacin is present mainly in the form of the cellular pyridine nucleotides NAD and NADP. Enzymatic hydrolysis of the co-enzymes can occur during the course of food preparation. Boiling releases most of the total niacin present in sweet corn as nicotinamide (up to 55 mg/kg). Nicotinamide may be toxic to the liver at doses exceeding 3 g/day for adults. Niacin was first described by chemist Hugo Weidel in 1873 in his studies of nicotine. The original preparation remains useful: the oxidation of nicotine using nitric acid. For the first time, niacin was extracted by Casimir Funk, but he thought that it was thiamine and due to the discovered amine group he coined the term "vitamine". Niacin was extracted from livers by biochemist Conrad Elvehjem in 1937, who later identified the active ingredient, then referred to as the "pellagra-preventing factor" and the "anti-blacktongue factor." Soon after, in studies conducted in Alabama and Cincinnati, Dr. Tom Spies found that nicotinic acid cured the sufferers of pellagra. Niacin is referred to as vitamin B3 because it was the third of the B vitamins to be discovered. It has historically been referred to as "vitamin PP", "vitamin P-P" and "PP-factor", that are derived from the term "pellagra-preventive factor". When the biological significance of nicotinic acid was realized, it was thought appropriate to choose a name to dissociate it from nicotine, to avoid the perception that vitamins or niacin-rich food contains nicotine, or that cigarettes contain vitamins. The resulting name 'niacin' was derived from nicotinic acid + vitamin. Carpenter found in 1951 that niacin in corn is biologically unavailable, and can be released only in very alkaline lime water of pH 11. In 1955, Altschul and colleagues described niacin as having a lipid lowering property. As such, niacin is the oldest lipid lowering drug. In animal models and in vitro, niacin produces marked anti-inflammatory effects in a variety of tissues – including the brain, gastrointestinal tract, skin, and vascular tissue – through the activation of NIACR1. Niacin has been shown to attenuate neuroinflammation and may have efficacy in treating neuroimmune disorders such as multiple sclerosis and Parkinson's disease. Unlike niacin, nicotinamide does not activate NIACR1, however both niacin and nicotinamide activate the G protein-coupled estrogen receptor (GPER) in vitro.